Click here if you'd like to join. ThisRandom Acts of Kindness Webring site is owned by Cindy Johnson. Want to join the Random Acts of Kindness Webring? Want to join the Young Military Wives' Webrin? 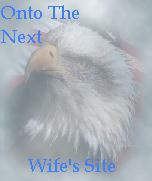 This Just Us site is owned by Cindy Johnson. Want to join the Just Us Webring? This Support Our Soldiers site owned by Cindy. Want to join Support Our Soldiers? Want to join the Messages With Meaning?